Meet My BritMums Live Sponsor! When I started blogging back in April 2012 I never imagined my blog would get to be where it is today and have given me the amazing opportunities I have achieved and received. I am absolutely delighted to announce my Britmums Live 2013 sponsor as The Gro Company. Having been blogging for over a year now I plucked up the courage and decided to go to Britmums Live 2013. This is my first blogging event I will be attending so I am slightly nervous yet excited. Hopefully it won't be the last. I hope I can meet some amazing bloggers and companies at the event. When The Gro Company agreed to sponsor me to attend Britmums Live I couldn't quite believe it, I was slightly overwhelmed. I already knew I wanted to attend the event but I was adamant I wanted to promote a baby related company which was relevant to my blog and share their brand with my readers and at the two day event. Having worked with The Gro Company in the past I couldn't have been happier! You may have seen my review of the Button Rose Grobag which we absolutely love. The Gro Company also sell The Gro-egg which we also have and love, Gro-clock and the Gro-blind which are all well known products to many parents. Be sure to check out The Gro Company for all your safe sleeping needs for your little ones. 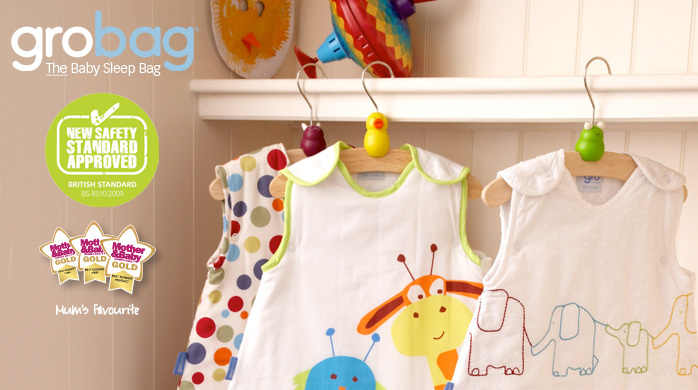 All of their products are available to buy at Mothercare, John Lewis, Babies R Us, Amazon, Kiddiecare and also their own retail website The Gro Store. I look forward to attending the event and gaining some more knowledge in blogging skills to improve Ohsoamelia. Thank you once again to The Gro Company for their generous sponsorship. You will be hearing much more about The Gro Company in the run up to and during the event. Ahhh, I'm so looking forward to meeting you. Don't hide in the toilets, everybody is so nice. Thank you, I really wanted to bring her but I think she's too old now.